Skate Park with Halfpipe by PLAYMOBIL INC. Kids can grind the halfpike, shred the railings or gleam the cube in their very own skate park. The set includes four figures with skateboards and helmets, orange cones, a toxic waste barrel and accessories. This product was selected for the Parents Magazine "Toys of the Year 2007" guide. Forest Lodge by PLAYMOBIL INC. Kick up your heels after a long day of exploring with this fun-filled forest lodge set. comes with the lodge, a family of four, farm animals, birds, a tree fort, deer care center and accessories for hours of enjoyment. This product received a 2007 Excellent Product iParenting Media Award. Engage your gladiators with competition in the arena. Features include audience seating with trap doors to the lions cages, wide gate and large battle area. Also comes with eight figures, two lions, a double-harness chariot and lots of accessories for hours of fun. "Playmobil toys allow the child's imagination to soar, while playing and learning!" Michelle Winfrey, advertising and marketing manager of Playmobil Inc., told TDmonthly. This product is a winner of the 2007 Oppenheim Gold Award. Launch date: August 2007. — The Roman arena includes a lot of little pieces to assemble, but it’s also a lot of fun to play with, offering opportunities for creative play with characters and animals that come to life in a sizeable play space. It earned a TDmonthly Top Toy 2007 award for its detailed figurines and accessories, its playful recreation of an historic landmark, as well as Playmobil’s widespread, positive reputation with specialty stores. — This Roman arena and accompanying accessories are best sellers for Brain Station and Tree Town Toys in Ann Arbor, Mich., Owners Hans and Tricia Masing told TDmonthly in fall 2007. Selected for Parents Magazine's "Toys of the Year 2007" guide, this playset allows kids to care for the sick residents of their own little town. This new hospital includes several figures, functional elevator, adjustable operating table with light, movable patient's bed, reception area, children and babies' sections and tons of accessories. This product is a Fall 2007 Parent's Choice Award, 2007 iParenting Media Award and 2007 Oppenheim Gold Award winner. Launch date: September 2007. WonderGo is a Go teaching kit for kids. It helps them discover the greatest strategy game of Asia using prize-fillable Go stones and a fully illustrated lesson book. This product was named one of Dr. Toy's Best Products for Spring 2007 and received the 2007 Game of the Year Award from Creative Child Magazine. Launch date: February 2007. Lions roam the African savannah in families called prides that are made up of related females, their children and a single male. When a male reaches adulthood he gets kicked out of the pride and has to go seek his own group. Female lions hunt as a team. Together they can overpower large prey like zebras, buffalo, giraffes, hippopotamuses and even young elephants, but they’re not above scavenging other animals’ leftovers. Lions sleep as much as 20 hours a day and both males and females defend their pride from any intruders. Lions’ roars are really loud and can be heard up to five miles away. Lance is 2.6” tall x 1.2” wide x 4.0” long. Linda is 2.0” tall x 1.0” wide x 3.8” long. As “vulnerable” animals, the lions are limited to 20,000 editions. 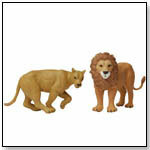 Noah's Pals are lovingly sculpted and beautifully handpainted animal figures. It's a fun and educational collection that’s perfect for both children and adults. "Each male and female pair of animals includes an educational ID Card that allows collectors to register Noah’s Pals on our interactive website where they can learn more about wildlife conservation," Co-founder Steve King of Caboodle! Toys told TDmonthly. This product received a Spring 2007 Seal of Approval from The National Parenting Center. Launch date: January 1, 2007. Safari Ltd.® introduced this addition to the stunning Incredible Creatures Series, which has more than 45 different replicas, in 2008. This hand-painted, phthalate-free Veiled Chameleon is intricately detailed and is in the midst of catching a butterfly. The Incredible Creatures series will ignite the imagination and stimulate the curiosity of every child. The Chameleon is soft to the touch for added realism and includes 5-language educational information. Replica size: 9.28” L x 4.3” H. Launch date: 2008. Awards: 2012 TDmonthly Top Toy Award. Why it won: Who says learning can't be fun? Safari LTD.®'s hand-painted figurines include educational information on the tag, and whimsical designs like the Incredible Creatures Veiled Chameleon — tongue sticking out to catch a vibrant butterfly — will engage kids' imaginations. This figure is durable, stands on its own, has a colorful exterior that will catch the attention of kids of all ages. The Bear Bear and Messer Combo Package by SPAZZMANIA ENTERTAINMENT INC. This package includes two award-winning educational DVDs, “The Bear Bear and Messer Show: Shapes and Colors” and “The Adventures of Andy Applebutter,” as well as Bear Bear and Messer plush toys in a clear backpack. The DVDs are targeted to ages 2 to 5 and 4 to 7, respectively, and teach color identification, word recognition, social skills and life lessons. Both come with a free downloadable activity book. The product received the 2007 Teachers' Choice Award for the Family. — President Lin Tam of Spazzmania Entertainment believes her product will do well in specialty stores “because there are not enough educational toys or DVDs that really focus on that market. These … are designed to help bridge a gap of communication between parent and child,” she added. “Both shows have garnered excellent awards and reviews.” Launch date: Fall 2006. Gheos by Z-MAN GAMES, INC. In this game, designed by Rene Wiersma, two to four players act as gods at the dawn of time, creating earth’s landscape and inhabiting it with people. To win, a player must have the most loyal, wealthy and powerful followers. Triangular tiles represent landmasses, and players must cash in their tokens, play temple tiles, or draw Epoch tiles to score. “At its heart, Gheos is a simple game, like Carcassonne, but offers a deep, strategic play and multiple scoring opportunities,” President Zev Shlasinger of Z-Man Games told TDmonthly. This product received a 2007 Mensa Select award. Launch date: December 1, 2006. This Spanish-language edition of “Juanita the Spanish Lobster” features a rude, overbearing lady lobster who wants to go to the land. The London Philharmonic Orchestra, with conductor Stephen Simon and narrator Rosi Amador, brings out the story's themes of hubris, dreams and determination. It is translated by the renowned author/children's book translator Yanitzia Canetti, and features British composer David Haslam’s passionate flamenco and bel canto opera music. It’s “the first Spanish-language CD to introduce children to classical music. It’s fun, it’s lively, it’s very Latin,” Bonnie Ward Simon, president and executive producer of Magic Maestro Music, told TDmonthly. This product received a spring 2007 Parents' Choice Silver award. Launch date: February 2007. Viewing products 1121—1130 out of 1181 products.